Grr, the curry doesn’t quite balance out my ever-growing hatred of humanity. And it was good curry too, so, something must be wrong. Except the picture doesn’t capture the sound, which is like a low grumble that will doubtlessly swell into an earth-shattering thunder that will hopefully somehow cause the sun to crash into the Earth and destroy everything that we know and love. Except Blur. Somehow I will save them. Chances are, if you’re a person, I’m angry at you. This is nothing personal. Well, for some people it is, but for most of you, it’s just an unfortunate side-effect of my last couple of days/weeks. You are an idiot. You almost killed yourself and the guy you were driving DOWN THE WRONG SIDE OF THE ROAD TOWARDS. 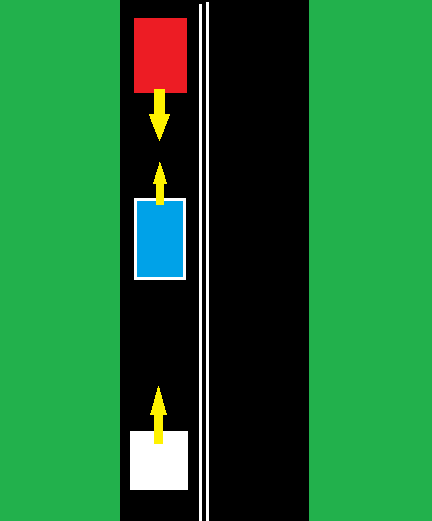 I would not have cared if you were driving down the wrong side of the road towards something heavy and inanimate and crumpled your black 4WD in around your own stupid ears, if not killing you, then at least somehow impairing your ability to propagate whatever gene for STUPID seems to dominate in your system. No, really, I’m not just road raging. Here is a diagram of what happened. Make up your own mind about whether we should start a) actually only giving licenses to people who can drive on the correct side of the road or b) just shooting people when they do stupid things. So the blue car ran off the road to avoid DEATH, and the guy in the red car decided to drift back onto the correct side of the road. Oh, and the other thing? Course that shall remain nameless (let’s just say, it’s not a chemistry course…hmm, that cuts out 6 of the 7 courses I take….) has this system where tutes are worth 10%. There are 11 tutes. You miss one, you lose 6%. WHAT? Even if it’s unavoidable and prearranged. 6%. Guess what, unnamed course? If you’re offering me a whopping 4% to turn up to 6 more tutes, I ain’t gonna make it the priority of my week. No, I’m not going to stop going to them all together, on account of I have more respect for my group members than that, and I don’t want to leave them to do all the tedious and pointless tute work on their lonesomes. I will however get myself a pleasant lunch during the first hour then show up for group work time. Good way to break up a 6 hour block. Now I have to write a play, and while I’m a brilliant and talented artist (cough) I have never written one before and I have no idea how they’re meant to end up looking/feeling/being. This one is going to pay out hipsters, but also show that they can be a caring and accepting race. Save a life, donate your oversized glasses frames to a hipster. Good night and good riddance.